Our physician leaders are all part of our multi-specialty physician group, NEA Baptist Clinic; offering over 100 physicians in more than 35 specialties. NEA Baptist Clinic is part of the NEA Baptist integrated health care system, offering care at our medical campus in Jonesboro and throughout the northeast Arkansas Region. 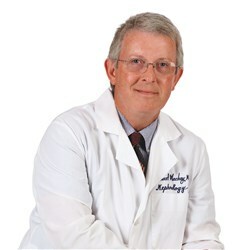 Michael G. Mackey, M.D., FACP, is a graduate of the University of Arkansas for Medical Sciences. He completed his residency in Internal Medicine as well as his Fellowship in Nephrology at the University of Arkansas for Medical Sciences – Medical Center Hospital/ VA Hospital. He began teaching in Internal Medicine in 1976 and continues to serve as faculty for UAMS. From 1981-2006, Dr. Mackey served as the Director of the UAMS/AHEC program in Jonesboro. He is the founding physician of his private practice Nephrology clinic, now part of NEA Baptist Clinic, where he continues to serve on the Board of Directors. In addition to maintaining his board certification in both Internal Medicine and Nephrology, Dr. Mackey was named “Nephrologist of the Year” in 2004 by the Arkansas Kidney Foundation. He enjoys flying airplanes and photography.